FSX/P3D 3 & 4 Native Boeing 737-500 Multi Package 1 with enhanced VC This is the native FSX Boeing 737-500 converted by Eagle Rotorcraft Simulations of the Eric Cantu original. 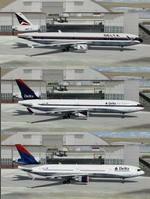 Liveries added: United, British Airways, Southwest Canyon, Southwest Sand, Westjet, Lufthansa, United 1980's. Native model by Eric Cantu/ Eagle Rotorcraft Simulations. The VC is the Alejandro Rojas Lucena/FSND Boeing 737-800 interior model. This virtual cockpit model includes Working wipers (right mouse click on switch) with rain effect. Switches for LCD Screens, EICAS, PFD, MFT. Autobrake switch. Opening pilots window. Cabin Lights switch. Realistic FMC. Ground Proximity Warning System (GPWS), More Realistic night VC textures. There are custom Boeing 737 sounds included for that extra realism. I have added the great textures by Colin Lowe, Jonas Wikander and others. Model is not modified in any way. VC added and textures. See VC docs to get the best out of the VC and FMC. Assembled and prepared and tested for P3D V3.4 /FSX by Chris Evans. FSX/P3D 3.4 Native Boeing 737-400 Multi Package with enhanced VC This is the native FSX Boeing 737-400 converted by Eagle Rotorcraft Simulations of the Eric Cantu original. 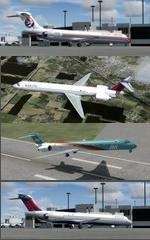 Liveries added: Kulula, City Bird, LOT, US Airways, Turkish. Native model by Eric Cantu/ Eagle Rotorcraft Simulations. The VC is the Alejandro Rojas Lucena/FSND Boeing 737-800 interior model. This virtual cockpit model includes Working wipers (right mouse click on switch) with rain effect. Switches for LCD Screens, EICAS, PFD, MFT. Autobrake switch. Opening pilots window. Cabin Lights switch. Realistic FMC. Ground Proximity Warning System (GPWS), More Realistic night VC textures. There are custom Boeing 737 sounds included for that extra realism. I have added the great textures by Gustavo La Cruz, Epremsoft and others. Model is not modified in any way. VC added and textures. See VC docs to get the best out of the VC and FMC. Assembled and prepared and tested for P3D V3.4 /FSX by Chris Evans. FSX/P3D 3.4 Native McDonnell Douglas MD-90 Multi Package with enhanced VC This is the native FSX McDonnell Douglas MD-90 converted by Eagle Rotorcraft Simulations of the Eric Cantu/SGA original. Liveries added: Japan Air Systems(JAS), Britishjet, Delta, China Eastern. Native model by Eric Cantu/ Eagle Rotorcraft Simulations. MD-90 sounds by SGA added. The VC is the Alejandro Rojas Lucena/FSND Boeing 737-800 interior model. This virtual cockpit model includes Working wipers (right mouse click on switch) with rain effect. Switches for LCD Screens, EICAS, PFD, MFT. Autobrake switch. Opening pilots window. Cabin Lights switch. Realistic FMC. Ground Proximity Warning System (GPWS), More Realistic night VC textures. There are custom Boeing 737 sounds included for that extra realism. I have added the great textures by John Newman, Callum Hege and others. Model is not modified in any way. VC added and textures. See VC docs to get the best out of the VC and FMC. Assembled and prepared and tested for P3D V3.4 /FSX by Chris Evans. Should work in P3D V4. FSX/P3D >4 Native Boeing 737-300 Multi Package with enhanced VC This is the native FSX Boeing 737-300 converted by Eagle Rotorcraft Simulations of the Eric Cantu original. 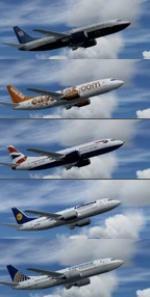 Liveries added: British Airways, Easyjet, Continental, United and Lufthansa. Native model by Eric Cantu/ Eagle Rotorcraft Simulations. The VC is the Alejandro Rojas Lucena/FSND Boeing 737-800 interior model. This virtual cockpit model includes Working wipers (right mouse click on switch) with rain effect. Switches for LCD Screens, EICAS, PFD, MFT. Autobrake switch. Opening pilots window. Cabin Lights switch. Realistic FMC. Ground Proximity Warning System (GPWS), More Realistic night VC textures. There are custom Boeing 737 sounds included for that extra realism. I have added the great textures by Josh Gore, Felix Blankenburg and others. Model is not modified in any way. VC added and textures. See VC docs to get the best out of the VC and FMC. Assembled and prepared and tested for P3D V3.4 /FSX by Chris Evans. FSX/P3D Airbus A350-900XWB LATAM Airlines Brasil (TAM) package. South American airline group, LATAM, currently (June 2016) have 6 A350-900 in service with a further 7 on order. The Airbus A350 XWB is a family of long-range, twin-engine wide-body jet airliners from the European aircraft maker Airbus. The A350 is the first Airbus aircraft with both fuselage and wings made mainly from carbon fibre structure. The A350 is intended to replace the A340 and compete with Boeing's 787 and 777. Added the great textures by Stefan Bree. Assembled using the pack base by FSPainter with enhanced Thomas Ruth A330 VC with updates by Phillip Wallaert, Louis Quintero and some further edits by Chris Evans. Tested in both FSX Acceleration and P3D. FSX/P3D Airbus A350-900XWB Singapore Airlines package. Singapore Airlines currently has 12 A350-900 in operation with 55 more on order. These are intended to replace the A330-300 and Boeing 777-200 fleets. The Airbus A350-941 XWB is a family of long-range, twin-engine wide-body jet airliners from the European aircraft maker Airbus. The A350 is the first Airbus aircraft with both fuselage and wings made mainly from carbon fibre structure. The A350 is intended to replace the A340 and compete with Boeing's 787 and 777. Added the great textures by Stefan Bree. Assembled using the pack base by FSPainter with enhanced Thomas Ruth A330 VC with updates by Phillip Wallaert, Louis Quintero and some further edits by Chris Evans. Tested in both FSX Acceleration and P3D. FSX/P3D McDonnell-Douglas Boeing MD-11 Delta Airlines retro package with virtual cockpit and working Honeywell FMC. Delta operated 17 MD11 until 2004. Package includes liveries: 1992, 1992 Skyteam, 2000, 2000 Skyteam, 2003. This is the new native FSX AI MD-11 model from FS Painter made flyable in FSX with the Thomas Ruth DC-10 VC added. Also used the characteristics of Thomas Ruth A330 for better flight dynamics. Edited views for cockpit viewpoint, contact points to fix wheels sinking into ground and air file so that this aircraft will now take off. Added textures by Mike Pearson. Added Honeywell FMC by Garret Smith. Prepared, tested and assembled for Prepar3D and FSX by Chris Evans.